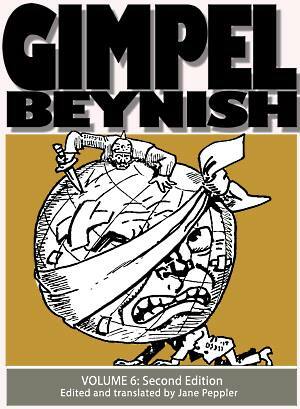 Click here to read about and order the seven Gimpel books I've published. Comics read right to left. 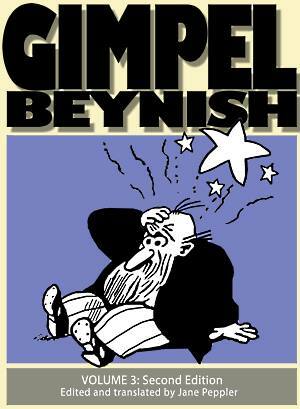 Click on any comic strip for larger view. 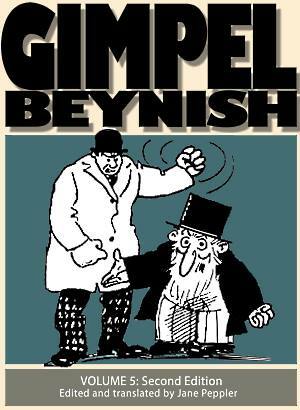 In the old country this sort of hat was called in Yiddish a cylinder (tsilinder) but we see in America it's known by the Yinglish name stov-payp. 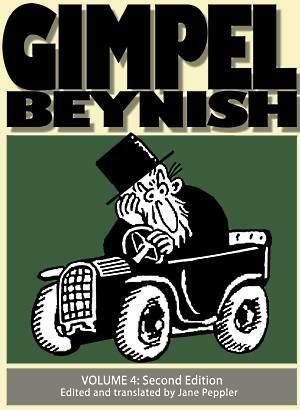 I think Gimpel's daily garb is more or less what cantors used to wear to services and is supposed to signify his respectability (that he is a layt). 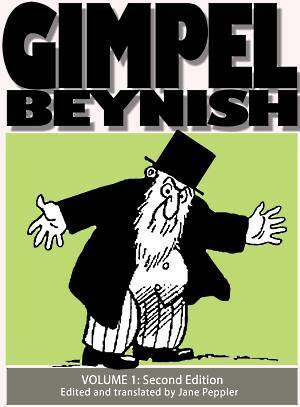 In the second comic strip see how an evidently wealthy Irish fellow wears the same suit. A frequently used Yinglish phrase is albetshe - I'll bet you, betcha. January 22, 1915: Even his stovepipe sometimes puts him at risk. Jake: There he sits. I'll betcha he's thinking about a match for me. Jake: I'll let him think till he's figured it out completely. 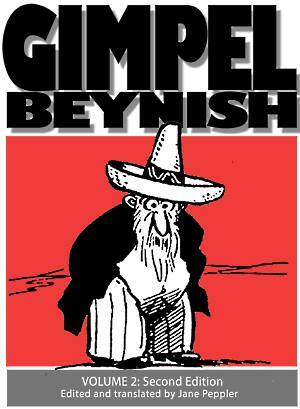 Jake: Say, Mister Gimpel Beynish, how much thinking do you have to do? Speak up. Jake: He isn't here! So! Has he deceived me, the old swindler? January 23, 1915: There are a lot of stovepipes, but not a lot of world-renowned matchmakers. GB: What kind of clown is this? I could swear it's me myself. GB: What's he playing at with me? Am I dreaming? Or maybe I should drink some shnaps. GB: What nerve! What an outrage! I'll soon show him who comes first. Fitzpatrick [in English]: I beg your pardon, sir! What is your name, my dear sir? אפֿילו זײַן סטאָװפּײַפּ שטעלט איהם אױך אַמאָל אין געפֿאַהר. דזשײק: אָט דאָ זיצט ער; אַלבעטשע ער טראַכט דאָס װעגען אַ שידוך פֿאַר מיר. דזשײק: איך׳ל איהם לאָזען טראַכטען ביז ער װעט אױסטראַכטען אין גאַנצען. דזשײק: סעי, מיסטער גימפּעל בײניש, װיפֿיעל נאָך איז דער שיער צו טראַכטען? אַרױס מיט לשון. דזשײק: ער איז דאָך גאָר ניטאָ! אַזױ, האָט ער מיך אָבגענאַרט דער אַלטער שװינדלער? סטאָװ פּײַפּס זײַנען דאָ אַ סך, אָבער ניט קײן װעלט-שדכנים. גימפּעל בײניש: װאָס איז דאָס פֿאַר אַ לץ? איך װאָלט געשװאָהרען אַז דאָס בין איך אַלײן. גימפּעל בײניש: װאָס טהוט זיך דאָס מיט מיר. חלום איך, אָדער איך דאַרף ערשט מאַכען אַ שנאַפּס. גימפּעל בײניש: אַזאַ חוצפּה! אַזאַ רציחה! איך װעל איהם באַלד װײַזען װער עלטער איז. פֿיצפּעטריק: אי בעג יור פּאַרדאָנ, סער! װהאַט איז יור נעים, מאַי דיער סער? The comics read RIGHT TO LEFT. Click any image for a larger view. 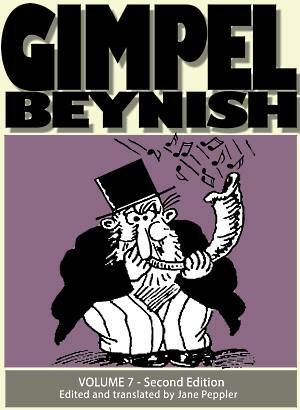 Visit Gimpel Beynish - the book!